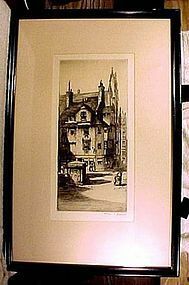 A Charles H. Clark John Knox House Limited Edition ethcing. This attractive 11-3/4" x 5-3/4" (plate size) etching by Charles Herbert Clark (England, b. 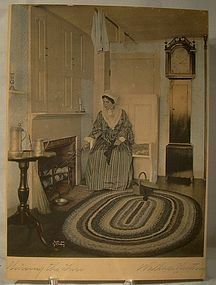 1890), depicting John Knox's House in Edinburgh, Scotland. Signed Chas. H. Clark in pencil in the lower right hand corner. Clark studied in the Liverpool School of Art and exhibited at the Walker Art Gallery. He resided in Liverpool, and his work was also exhibited at the Royal Academy. This framed etching is one of a limited (restricted) edition of 156 proofs. The original tag is applied to the back (the etching has been reframed in a 19" x 20-1/2" black painted wood frame, and the tag says: John Knox's House Edinburgh. An original etching by Chas. Clark. Signed impression. Restricted edition of 156 proofs. Plate destroyed. This item is in excellent original condition with no tears, foxing, soiling, fading, losses, damage or repairs. All items are thoroughly and conservatively graded and all condition issues are noted; all items are vintage or antique and may have slight signs of gentle use. Expedited tracked and insured parcel shipping to the U.S. starts at $25 (other spots may vary, air is higher). Items paid with a credit card will be shipped to confirmed addresses only. We do ship internationally. All of our prices are in $US. PLEASE NOTE: We DO NOT accept PayPal. A Wallace Nutting Nursing the Fire pencil signed photo. This unframed hand coloured and signed photograph print is by Wallace Nutting who was famous for his tinted photos, and those in our listings (four in total) are all sought after interior scenes. This 9-5/8" X 7-5/8" photo is mounted on a signed 10-1/2" X 7-3/4" mat and it is titled "Nursing the Fire", and it is copyrighted 1912. This photo retains its bright colours and it is in mostly excellent condition with no tears, scrapes, fading, bends, losses, damage or repairs other than some light spotting on the photo, either moisture or foxing. The signature and title is in pencil rather than in pen, which is more common on early Nuttings, and far rarer than the pen signatures. All of the Nuttings listed have the light coloured reverse copyright mark and date in the image, also something usually seen on the earlier Nuttings. 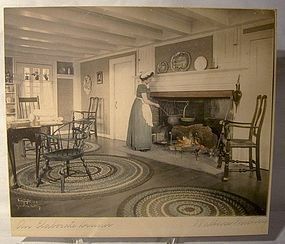 The mats are a yellowed tone as may usually be seen with matting of this age. We don't ordinarily see unframed Wallace Nutting prints, so cannot say whether; it also has one small corner bump and the mat possibly has been trimmed, it may well have been. All items are thoroughly and conservatively graded and all condition issues are noted; all items are vintage or antique and may have slight signs of gentle use. Tracked Packet shipping to anywhere in the U.S. is $15.00 - this includes online tracking, air service and insurance up to $70. Items paid with a credit card will be shipped to confirmed addresses only. We do ship internationally. All of our prices are in $US. PLEASE NOTE: We DO NOT accept PayPal. A Wallace Nutting An Elaborate Dinner signed photo. This unframed hand coloured and signed photograph print is by Wallace Nutting who was famous for his tinted photos, and those in our listings are all sought after interior scenes. This 9-3/8" X 7-3/8" photo is mounted on a signed 9-1/2" X 8-1/4" mat and it is titled "An Elaborate Dinner", and it is copyrighted 1909. The signature and title is in pencil rather than in pen, which is more common on early Nuttings, and far rarer than the pen signatures. All of the Nuttings listed have the light coloured reverse copyright mark and date in the image, also something usually seen on the earlier Nuttings. This photo retains its bright colours and it is in mostly excellent condition for unframed with no tears, scrapes, fading, bends, losses, damage or repairs other than some minor light coloured spotting on the upper of the photo, moisture or foxing. The mats are a light yellowed tone as may usually be seen with matting of this age and this one has a 1/2" tear below the first N in dinner. We don't ordinarily see unframed Wallace Nutting prints, so cannot say whether the mat has been trimmed, it may well have been. All items are thoroughly and conservatively graded and all condition issues are noted; all items are vintage or antique and may have slight signs of gentle use. Tracked Packet shipping to anywhere in the U.S. is $15.00 - this includes online tracking, air service and insurance up to $70. Items paid with a credit card will be shipped to confirmed addresses only. We do ship internationally. All of our prices are in $US. PLEASE NOTE: We DO NOT accept PayPal. 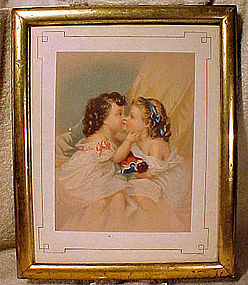 A mid-Victorian chromolithographic print c1860-80 in a period gilt frame depicting two kissing children with a doll. This unsigned 7-1/4 x 5-1/2" print is mounted on a lined mat and encased on a period 11 x 9" gilt wood frame with original glass; it is in excellent original condition with no rips, tears, foxing, staining, fading, losses, damage or repairs other than a small water stain to the mat on the lower right corner and some minor scrapes to the gilding on the frame. All items are thoroughly and conservatively graded and all condition issues are noted; all items are secondhand and may have slight signs of gentle use. Surface shipping to the continental U.S. starts at $13.50 (other spots may vary) - insurance is included. Items paid with a credit card will be shipped to confirmed addresses only. We do ship internationally. All of our prices are in $US. NOTE: we do not accept PayPal.